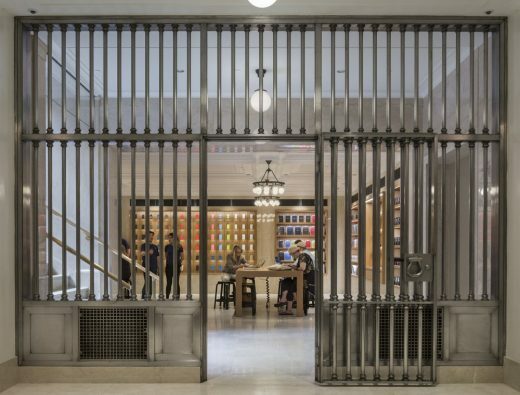 San Francisco, CA (January 21, 2019) – The American Institute of Architects have selected the Bohlin Cywinski Jackson-designed Apple Store, Upper East Side as one of nine projects to receive its prestigious award. The awards program honors notable achievements in architecturally spectacular interior spaces. Pittsburgh, PA (August 24, 2018) – Jon C. Jackson, FAIA, retired principal of national architecture firm Bohlin Cywinski Jackson (BCJ), passed away on August 17, 2018. A Pittsburgh area native, Jon was a highly-respected figure in both the Western Pennsylvania and national design communities, and his life’s work was a major influence in BCJ’s rise to national and international prominence. Much of Jon’s career was devoted to the realization of large, technically complex projects. He was especially skilled in designing academic spaces and laboratories for scientific advancement, often noted for their vivid architectural expressions. His career also paralleled the emergence of computer science as a distinct discipline, and his work helped to define the interactive workplace that serves as a model for today’s innovative technology companies. Jon’s buildings were intentionally envisaged as humane workplaces, thoughtfully shaped by his concern for individual and social well-being. He valued the exploration and invention that occurred within these spaces, and often commented that his role—improving humanity through thoughtful design—inspired him far more than awards or accolades. This concern for human nature, embodied in many of the projects he led, has become one of the pillars of the creative workplace movement. 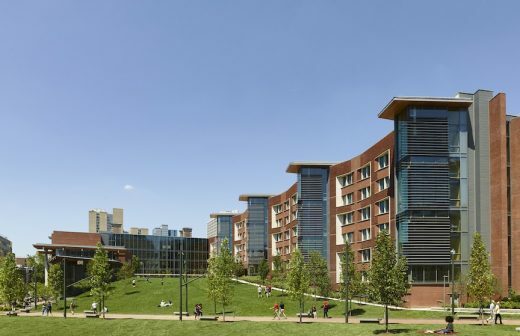 Jon designed buildings for many prominent academic institutions during his career, such as the University of Pittsburgh, Dartmouth, Rensselaer Polytechnic Institute, University of Washington, Caltech, University of Illinois Urbana-Champaign, Yale, and the University of California. 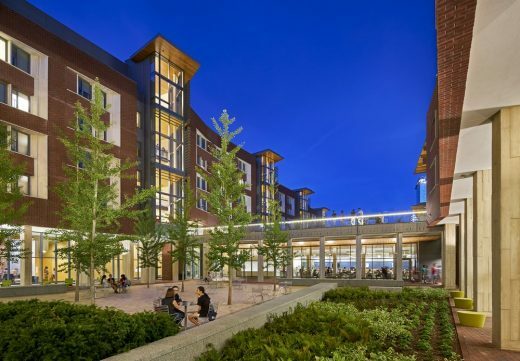 Many of these projects, including the Software Engineering Institute and the Intelligent Workplace at Carnegie Mellon University—both AIA National Award-winners—helped inform the firm’s future and current workplace designs, and set the stage for collaborations with some of the world’s most innovative companies, such as NeXT Computer, Pixar, Adobe, Disney, and Apple. That environment is perhaps the greatest of Jon’s professional legacies. It was under his leadership that BCJ’s Pittsburgh studio came of age; he also played an instrumental role in establishing the practice’s Seattle and San Francisco offices. Many of the firm’s current West Coast-based principals began their careers with Jon in Pittsburgh, following his lead to take BCJ’s ethos to new levels. Jon’s interest in advancing the appreciation and understanding of great design also found expression in activities beyond his work at BCJ. He was a passionate black and white photographer, and often exhibited his unique eye for composition at shows throughout the Pittsburgh area. He also lectured on a range of design topics at Carnegie Mellon University. Jon was a long-time resident of Pittsburgh’s Chatham Village, widely regarded as a landmark achievement in community planning. A major advocate for Chatham Village’s preservation, Jon helped earn the community’s listing on the National Register of Historic Places. Those wishing to honor Jon’s remarkable life with a contribution are invited to choose their favorite charitable or nonprofit organization dedicated to design and architecture. 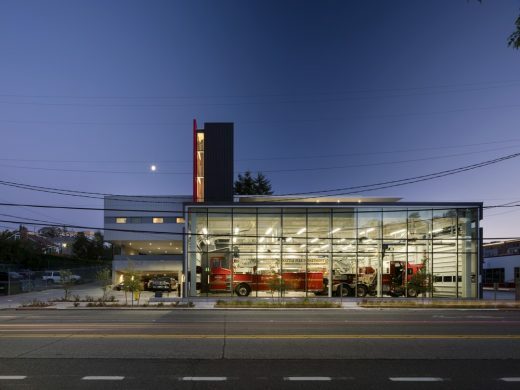 City of Seattle Fire Station 32 is an 18,000-square-foot facility located in the heart of the fast-growing West Seattle Alaska Junction neighborhood. This centrally located station houses Engine Company 32, Ladder Company 11, Medic Unit 32, and Battalion Chief 7 serving West Seattle. Renowned firm awarded prestigious Silver Medal, Honor Award and Citation of Merit at state’s annual celebration of architectural excellence. 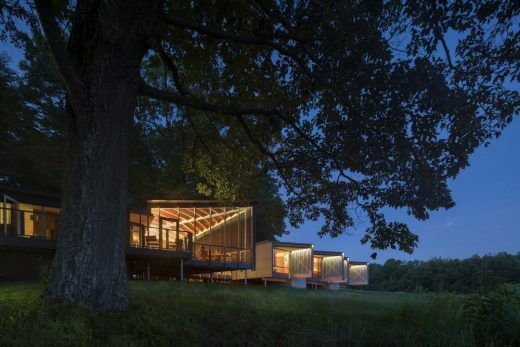 Three Bohlin Cywinski Jackson projects, including a living and learning facility for 350 students at the University of Pennsylvania, a home for family gathering along Lake Michigan’s northern shores, and a minimalist retreat for architecture and design for students of the Western Pennsylvania Conservancy’s Fallingwater Institute, were honored at AIA Pennsylvania’s annual Architectural Excellence Design Awards Gala on November 10. The three projects, which showcase the firm’s aptitude for design at a variety of scales, were selected from a pool of over 150 submissions from a variety of Pennsylvania architects firms. The annual awards ceremony brings Pennsylvania’s architecture community together in celebration of the creative and innovative work of AIA Pennsylvania member firms. 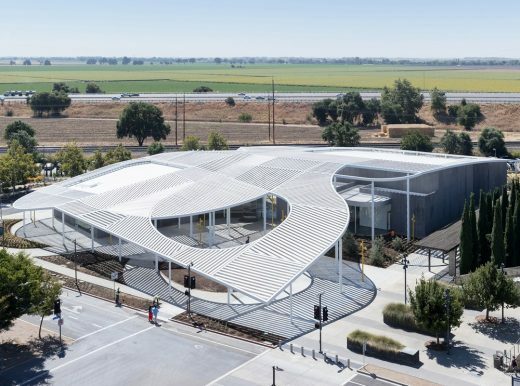 As a new focal point and destination for the entire community, the Manetti Shrem completes UC Davis’ vision for an arts district on the south side of campus, complementing the Mondavi Center for the Performing Arts. Apple’s newest Manhattan retail store, designed by Bohlin Cywinski Jackson, opened last month in the recently completed World Trade Center Oculus. 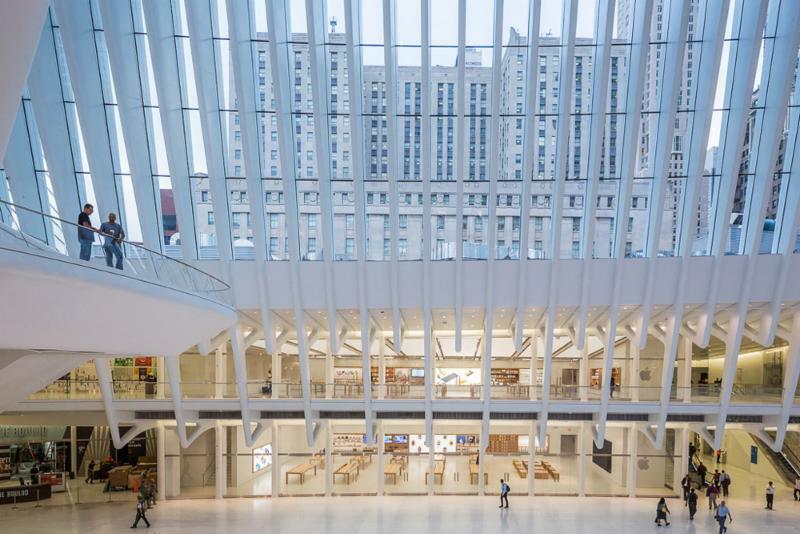 Prominently positioned in the epicenter of the bustling transportation hub, the new store is the only space to inhabit two levels and a full quarter of the light-filled structure. Wilkes-Barre, PA (October 4, 2016) – The Thomas and Stacey Siebel Foundation and the University of Illinois at Urbana-Champaign today announced a $25 million gift to establish the Siebel Center for Design. The new two-story building, designed by distinguished architectural practice Bohlin Cywinski Jackson, will be a campus-wide hub for student-focused design thinking and learning. Prominently located on one of the major campus axes, the new 68,000-square-foot facility will connect the north and south areas of campus and support instruction and research in undergraduate and graduate programs across multiple disciplines. Rather than offer independent degree programs, the Center will help colleges incorporate design principles, concepts and practices into their own offerings. 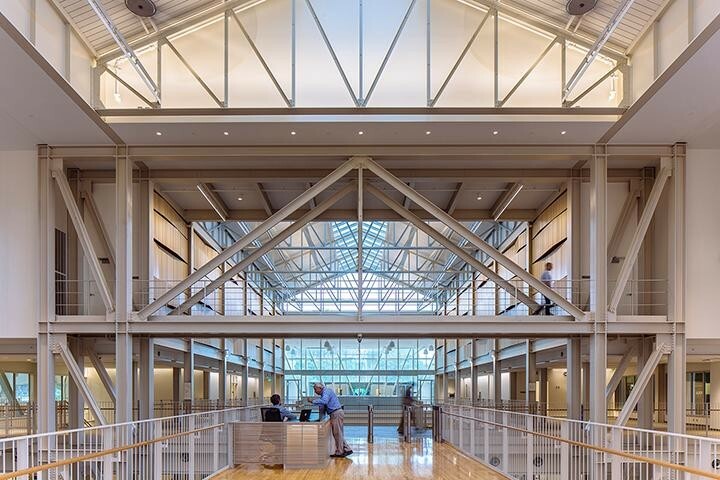 A team from Bohlin Cywinski Jackson’s Wilkes-Barre, Pennsylvania, office developed the building’s design concept from extensive research based on space planning, organizational structure and building systems created to support a nonlinear approach to instruction. Understanding the type of learning to occur in the Center, which will focus on experience-based discovery processes, conceptualization and prototyping, led to an architectural design and programmatic solution that will maximize teamwork, flexibility and transparency. 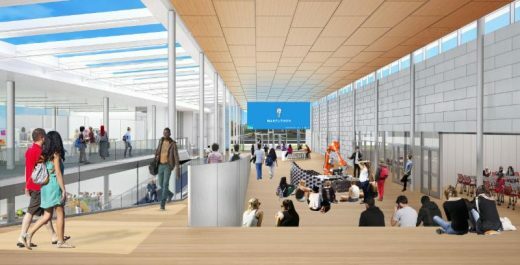 The Center will feature five team-based collaboration studios for up to 100 students, including one studio for large-scale construction and graded access for full-sized prototypes. It will also include a workshop for 3D printing, metal fabrication, laser and water-jet cutting, and computer-controlled machining. Two digital media studios will support video and audio recording, as well as technologies for virtual reality applications. There will also be public gathering spaces, meeting rooms and galleries to encourage more informal interaction. Tom Siebel, who earned an undergraduate degree in history and graduate degrees in business administration and computer science from the University of Illinois at Urbana-Champaign, conceives the new Center as a facility and resource to bring students, faculty and external stakeholders from many fields together to solve real-world challenges. “The combination of top tier academics and entrepreneurial drive at UI is powerful. By infusing all areas of study with the multidisciplinary approaches of design thinking, this facility will create unlimited opportunities for UI students to fuel and nurture that drive,” says Siebel. Groundbreaking for the Siebel Center for Design is planned for the summer of 2017 with construction expected to take approximately 18 months. Mr. Siebel is the chairman and chief executive officer of C3 IoT, an enterprise PaaS and SaaS software company that enables companies to design, develop, deploy, provision, and operate large-scale IoT applications. C3 IoT applies the power of big data, advanced analytics, social networking, machine learning, and cloud computing to enable the rapid development of IoT SaaS systems. Mr. Siebel was the founder, chairman, and chief executive officer of Siebel Systems, one of the world’s leading software companies, which merged with Oracle Corporation in January 2006. Founded in 1993, Siebel Systems rapidly became a leader in application software with more than 8,000 employees in 32 countries, over 4,500 corporate customers, and annual revenue in excess of $2 billion. The Thomas and Stacey Siebel Foundation, established in 1996, funds projects to support energy solutions, educational and research programs, public health, and the homeless and underprivileged. Thomas Siebel is the founder and chair. 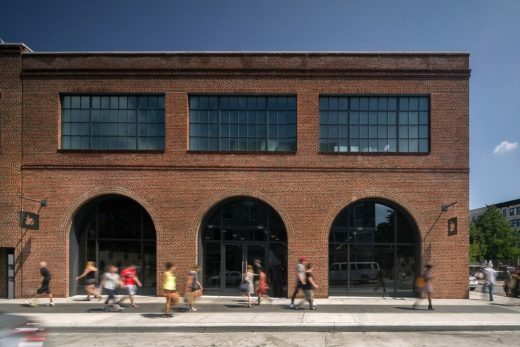 A 13,700-sqft retail space to complement Brooklyn’s historic industrial past, drawing inspiration from the brick façade and arched openings of the preexisting building. 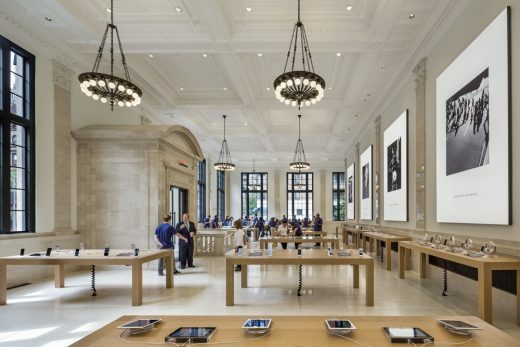 The building has a distinct look and feel compared to Apple’s other New York locations. The Frick Environmental Center (FEC), the world’s first municipally owned, Living Building Challenge-targeted project, will be unveiled to the public for the first time in a public celebration on Saturday, September 10. Designed by renowned architecture firm Bohlin Cywinski Jackson (BCJ), the building will be a world-class center for environmental education. San Francisco, CA (April 26, 2016) – The Preservation League of New York State has selected the Bohlin Cywinski Jackson-designed Apple Store, Upper East Side as one of two New York City projects to receive its prestigious Excellence in Historic Preservation Award. 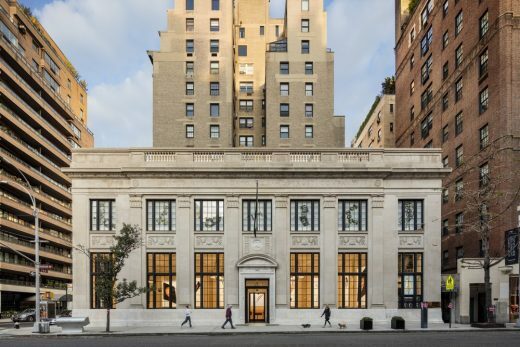 The League’s statewide awards program honors notable achievements in reclaiming and preserving New York State’s irreplaceable architectural heritage. Located at Madison Avenue and 74th Street, the project is an adaptive reuse of architect Henry Otis Chapman’s 1922 U.S. Mortgage & Trust building, now home to Apple’s most recently completed Manhattan retail store. 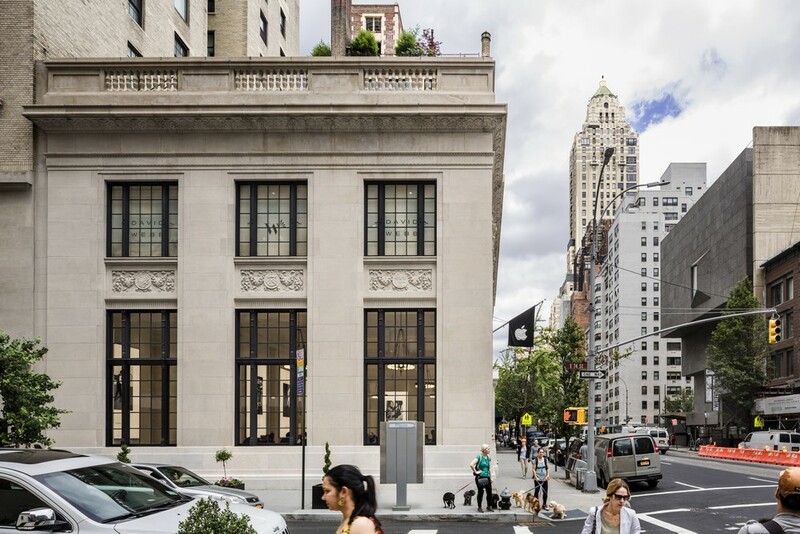 The neighborhood is characterized by a mixture of luxury-brand retail shops and several notable landmarks, including the Metropolitan Museum of Art and Marcel Breuer’s Whitney Museum. 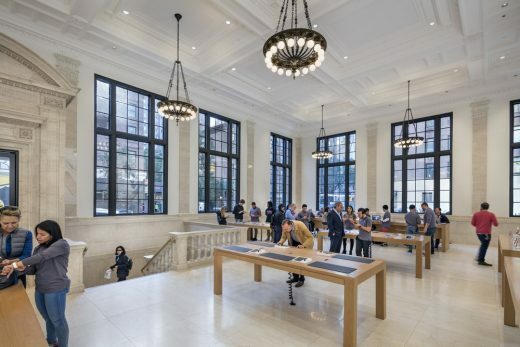 Apple collaborated with Bohlin Cywinski Jackson and its consultant team to restore the building’s general ambiance. The project included exterior restoration that required significant repair to many of the building’s original windows; exterior paint, stone, and grout were also reconditioned. The interior finishes, such as the marble entry, plaster coffered ceilings, and chandeliers, were reconstructed with the help of historic photographs and blueprints. 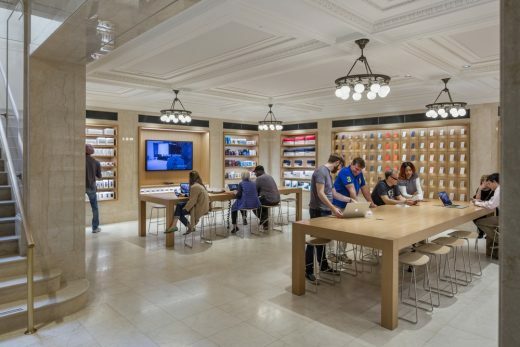 Sensitive alterations were made to the building’s original banking hall, which now serves as the store’s main sales floor. 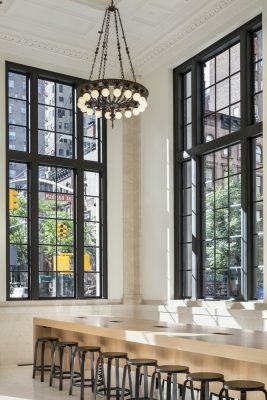 To recover the light and airy qualities of the space, partitions and mezzanines were recreated, and columns and thick bearing walls removed. The original vault room, repurposed as a private sales space, allows for a more personal customer experience. In addition, many upgrades to building services were made during renovation. This is Apple’s fifth New York retail store to be designed by Bohlin Cywinski Jackson. 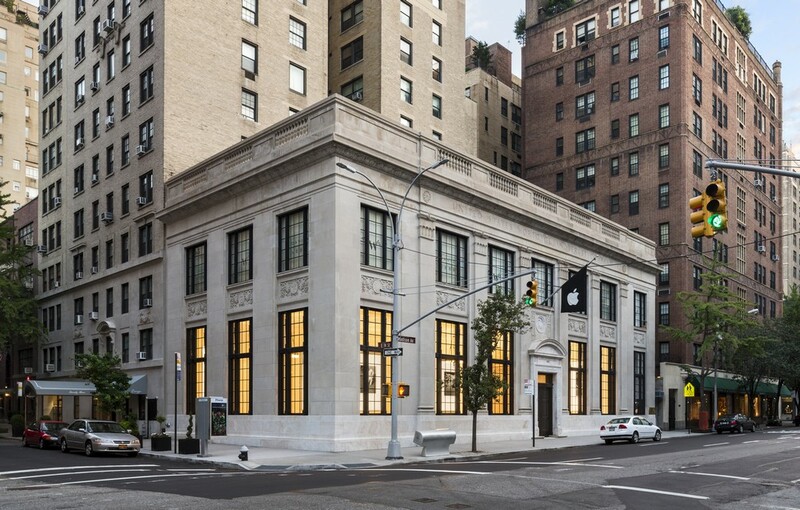 Others include Apple Store, Fifth Avenue (2006, 2011); Apple Store, SoHo (2002, 2012); Apple Store, Upper West Side (2009); and Apple Store, West 14th Street (2007). 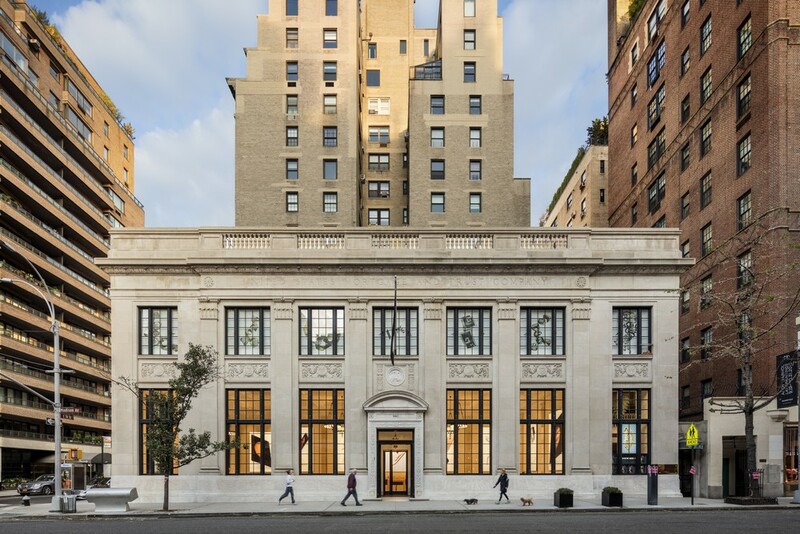 The United Nations Campus Headquarters Glazed Façades Replacement project, led by Heintges & Associates, will also be honored during this year’s Preservation League Awards Ceremony in New York City on May 11 at the historic New York Yacht Club. The Preservation League of New York State invests in people and projects that champion the essential role of preservation in community revitalization, sustainable economic growth, and the protection of our historic buildings and landscapes. We lead advocacy, economic development, and education programs all across the state. The Preservation League’s Excellence in Historic Preservation awards program is funded by a generous grant from the Arthur F. and Alice E. Adams Foundation. He was famous for designing Philadelphia’s rebuilt Independence Mall, its new Liberty Bell Pavilion, and its first Apple store. Bernard Cywinski worked for 30 years at the Philadelphia Architects studio titled Bohlin Cywinski Jackson, led by Peter Bohlin. Bohlin Cywinski Jackson is famous for designing the Apple stores prototype, including the Fifth Avenue Apple Store in NYC, and for designing a large Seattle home for Microsoft’s Bill Gates. Founded in 1965, is a national architecture practice noted for elegant and humane design, ranging from modest houses to large academic, civic, cultural and corporate buildings. 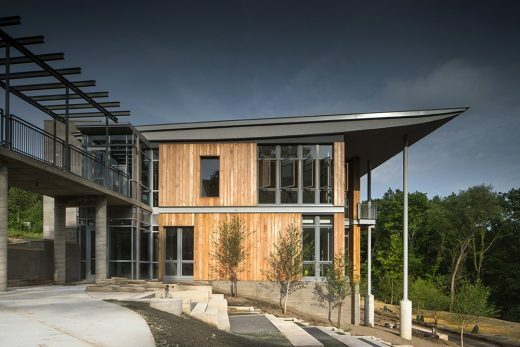 To date, the firm has received more than 650 regional, national and international awards for design, including three AIA Top Ten Green Project Awards and the AIA Architecture Firm Award. The firm is well-known for its work with Apple, designing stores such as the iconic Fifth Avenue cube in New York City and flagship stores worldwide. 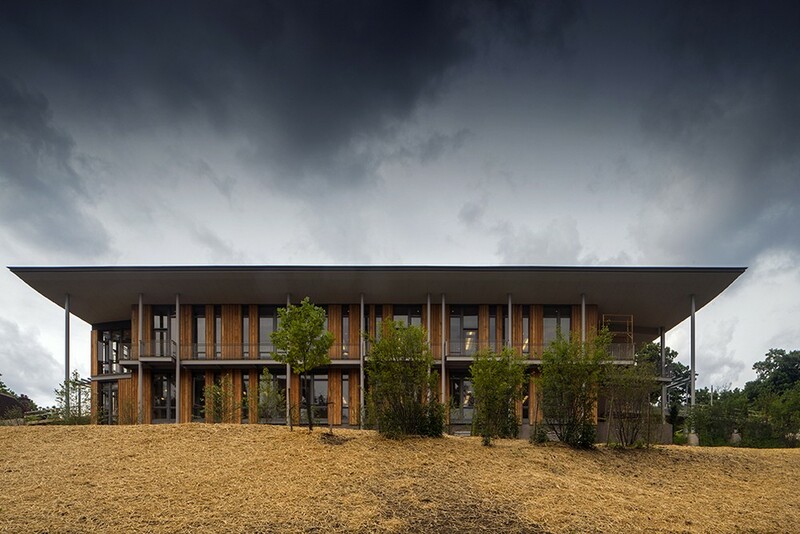 The practice has also created headquarters for Pixar, Adobe and Square, and city halls in Seattle and Newport Beach, CA. For more information please visit BCJ.com. January 22, 2019 in Architects.